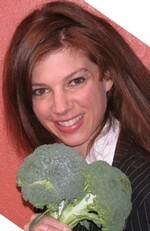 Meet Nutritionist Suzette Kroll Barancik! Nutritionist Suzette Kroll Barancik, RD, is a well-regarded expert in the nutrition field. She is a registered dietitian, certified intrinsic coach and specialist in nutritional counseling. She has been inspiring good nutrition habits in others since 1991. Suzette is a private practitioner in Tucson, AZ and a senior staff member at the world renowned Canyon Ranch Health Resort in Tucson, Arizona. Suzette's advice has been seen in Seventeen Magazine, Mindful Mama Magazine, The American College of Sports Medicine Fitness Journal, Weight Watchers online, and on various cable and television stations, including the Food Network. She is a member of The American Dietetic Association, The National Physique Committee and The International Natural Bodybuilding Association. Suzette specializes in weight loss and sports nutrition as well as nutrition relating to heart disease, diabetes, vegetarianism, and teen eating. Leading by example, Suzette is both motivational and inspirational, relating effectively to women and men from all walks of life. Have you considered the services of a personal nutritionist? Here's what one of Suzette's clients has to say about her. Suzette is best known for her personable style, quick wit, and ability to translate the latest scientific findings into advice about what to eat for dinner. Her hobbies include yoga, weight training, writing, reading, and chocolate chip cookies. Not necessarily in that order. Hi, I'm Suzette Kroll Barancik. Thanks for checking out my site! I hope you'll allow me to be your personal nutrition guide. If so, know that you are not alone. Most of my clients have the same issue. I refuse to believe that anyone chooses to eat high fat, high sugar, low fiber foods because they think these foods are good choices and will result in optimal health. You know what to do. I'll help you do what you know. Easy weight loss based on the glycemic index. Free low glycemic food list and recipes. My many years of experience in the field of nutrition have taught me that eating well is a process, not a destination. With that in mind, know that I'll be by your side providing information and support every step along the way as you move toward your goals. Eating is something we do every day, but eating well is another story. Many of my clients use me not only for guidance but as someone they can "own up" to about poor eating choices. You may find you eat better when you know someone's "watching." I hope that if you've learned anything from visiting this site it's that I love my job. Please eat well, be healthy, and let me know if there's anything I can do to help! I'm honored to be your personal nutrition guide. Wondering whether you need to meet with a dietitian? Find out how YOU can become a dietitian.